Things to do in Camaguey. A short list of the top things to do in Camaguey. Don't go to Camaguey without looking at this list first! The labyrinthine streets of Camagüey have a slightly Moroccan feel you won't find anywhere else in Cuba. 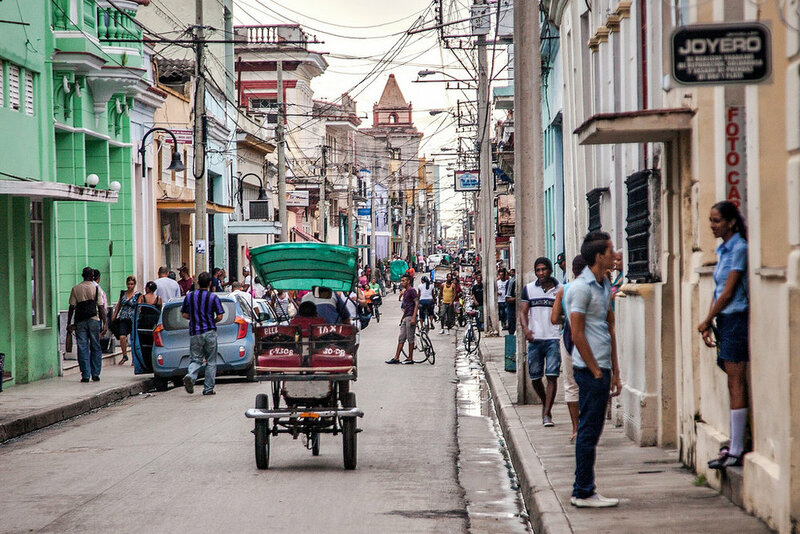 The streets were designed to fend off pirates, but today they are just one cultural highlight among the many things to do in Camagüey. Historic Cinema Street housed the first cinema in Camagüey and has recently undergone a serious remodel to celebrate the 500th anniversary of the city. The original movie theater is now a film themed restaurant, but there are many other cinemas open on the street today. The world-renowned Camagüey Ballet Company performs in the Teatro Principal. The theater was built in 1850 and is as impressive on the outside as the popular ballet performances that occur inside. Seeing a ballet is one of the top things to do in Camagüey. One of the most fun things to do in Camagüey is visit the Mercado Agropecuario Hatibonico. Visit the herberos to purchase secret elixirs, potions and the ingredients to brew up your own magic. Or just buy some fresh fruits to snack on. For a variety of things to do in Camagüey all in one spot, head to Plaza San Juan de Dios. This square is lined with colorful facades housing restaurants and bars. Plus, the Museo de San Juan de Dios is just steps away. Ornate, white Gothic tombs fill the expanse of Cuba's second most famous cemetery. Tours of this necropolis are among the things to do in Camagüey and depart regularly from the entrance behind Iglesia de San Cristo de Buen Viaje. Famous Cubans buried here include Ignacio Agramonte, Salvador Cisneros Betancourt, and Tomás Betancourt. This museum is often overlooked because the exhibits inside are somewhat forgettable. However, the lobby has ornate, soaring pillars that are not be missed. The crowd favorites are the frescoes that have been uncovered in the bathrooms, which are still working restrooms despite the discovery. Joel Jover and his wife Ileana Sánchez are two of the most accomplished contemporary artists in Camagüey. Their studio and gallery is open six days a week so you can explore the current exhibits. This is the ceramics capital of Cuba so one of the best things to do in Camagüey is shop for ceramics. The top ceramics artist in the city is Martha Jiménez Pérez who is also an accomplished painter and sculptor. Her studio is open daily.